Wednesday and it’s a nice sunny day so of course I’m informed If my train runs at all, and they can’t promise that it will. As they have now added to the “wrong type of leaves on the track” excuse with “if there is more than 1 day sunny weather and the tracks may buckle”, so most trains run slower or are cancelled, welcome to the 21st century! So as this is a shorter trip than initially intended, I grovel a bit, and considerate as he is my brother drives me to London. Well Hounslow on the outskirts of London but a convenient tube journey away. Now I’d heard of the problems with the tube and heat and honestly thought they were exaggerating. But I can tell you, I may not be a perfect physical specimen but most bits work okay, and I was a few “shallow” breaths from a panic attack caused by lack of oxygen. I’ve NEVER known such heat. I get to London and settle into my London home “The Royal Adelphi” before going to Leicester Square to check the TKTS Booth. 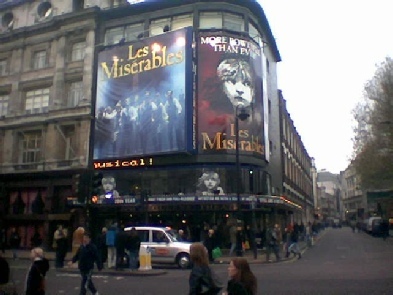 When I get there I see that Les Miserables is available at 25% off so that’s me set. I’ve heard rumours of changes and want to see what all the fuss is about. So there you are in less than 3 hours I’m in London and I’m in a theatre not bad for someone who lives over 170 miles away. I’ve seen this show as i say about 4 times already, and to be honest I think I noticed a few of the changes, but nothing earth shattering. Performance wise it was a treat, the lovely Joanna Ampil has returned to the cast, and unlike her fellow Miss Saigon alumni Lea who also performed in this show playing Eponine, Joanna is playing the role of Fantine, and she plays it wonderfully, her voice is excellent and she really puts everything into it. The role of Valjean is currently played by Jeff Layton, a Scot with a comprehensive record with the show having played the role over 2,500 times! But you certainly couldn’t say he was going through the motions, he seemed as fired up and focused as if he was auditioning for the role. Another cast member of note was Lydia Griffiths as Cosette, now I was going to mention this lady even before checking in the programme and finding out she was Welsh. Talented, pretty and I’m sure she is on the posters on the buses around London for the show as well… go girl! Overall i think the show has stood up well. With all the cast putting in good performances.As the longest running show in the West End i wish it many more years, although with the current situation in London, i’m not holding my breath. After a little checking I’ve discovered that Denise Van Outen doesn’t do the Friday matinee of “Tell me on a Sunday” so I’ve booked for this evening to see this show. Basically on the strength that I liked the title song whenI heard it sung years ago in it’s original incarnation, and the strength of Denise’s performance on the Parkinson show. My seat was three rows from the back of the stalls but in this theatre (Home of The Graduate last time I was there) it’s still a good view, and anyway as soon as I got there a very very nice lady said you can move up and into the centre if you like, so Rob gets an aisle seat again. The show is a one-woman performance and tells of a London girl who after ending a long time relationship heads for New York to start a new life. The stage is set with a settee, airline seat, table with chair and a sun lounger. It revolves, there is very effective use of projection onto three sides of the stage and the orchestra is behind the backcloth. When this show was first announced there were cries of “oh god another tv star in the west end” these were slightly muted as Denise… I think I can call her that …well she ain’t gonna be reading this now is she… although you never know… Ms Van Outen then, did train in a drama school (okay so did Martine but the least said about that the better). Has played Roxie Hart in Chicago both in the West End and on Broadway as well as performing Shakespeare at the Barbican. All I can say of her performance is welcome home, she really must be persuaded to continue in Theatre, as with her high profile, “ladette” outlook and wide fan base she will bring a whole new audience to the Theatre, something it really needs right now. 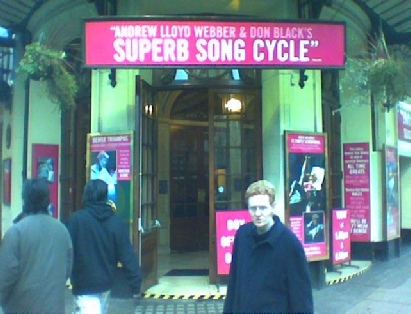 The show has been significantly re-worked by Lord Lloyd Webber, Don Black and Ms Outen. To such an extent I missed the introduction to one of my favourite songs “unexpected song”. Really it’s just updating the story to include: e-mail, text messages and put in a more millennium feel to what is really a 27 year old show, not old by theatre standards but still it works really well with the up to the minute references. My favourite songs were: “unexpected song”,” take that look off your face”, and the heart felt “come back with the same look in your eyes”. All of the show was excellent and at approximately 1hr 20 mins with no interval it’s a great way to be introduced to the world of Musicals without hitting the longer heavier shows. As talking to non theatre fans the thought of being “locked in for hours” seems one of their biggest fears. On walking back to the Hotel I was greeted with a perfect example of mind over matter… in this case “if I haven’t got a mind it doesn’t matter …what other people think.” We all know of the tendency of some people to fit the type of sound system in a car that could make your ears bleed if it were installed in the Millennium Stadium. Well I was walking down Villiers street when I hear the Boom Boom Boom of the base and am greeted by this huge black Range Rover easing it’s way through the throngs of people. Only when it pulls level with me do I realise that the sound isn’t coming from there, I look… no other vehicles in the street, I think ghetto blasters must be making a come back. Then I realise, immediately behind the Range Rover and rocking from side to side with the force of a sub woofer the size of Kent, is a Dell Boy three wheeler… with wait for it… BLACKED OUT WINDOWS! So to my first full day in London, and I head over the river as Rob Is going to a TV studio, no I’m not appearing, well actually I did but that’s another story. I’d contacted the ticket office for the Terry and Gabby show after hearing they were offering seats for the recording of this live daytime magazine style show. So heading for the London eye, as the show is recorded in the building where you get the tickets for this easily found attraction, I nearly melt on my way there. When I get there I half empty a water dispenser and then we are ushered into the studio, to be greeted by my first surprise of the day, I vaguely remembered that Chris Evans, him of Ginger hair and 8 hour liquid lunches, was a producer on the show but thought this was just in name and someone else would do the day to day stuff but no, there was the big man himself. Guiding the guests to their positions, letting the audience know what was likely to happen and quietly, ok anything but quietly giving orders – read suggestions to the crew. Enter Terry Wogan & Gabby Roslin, a surreal moment as although I’ve seen celebrities in the flesh before to see the great man bounding down the stairs and then being faced by a “dead” auto queue was well… Weird. The show today features an interview with Kate Aidy the war reporter. Who was there to publicise her book of stories from her years as an international correspondent. Now i know she is very good at what she does and seems a very nice lady. But to a rabid Elvis fan like me more interesting was the fact that I spent some time in a room with royalty…well a bit of him… a snipping of hair from the king of Rock and Roll Elvis Presley. As close as I’m likely to get now short of taking lessons from Burke and Hare. Me – Thinks – Mummy let me outta here! You see unusual as it seems with my size but I’m happiest fading into the background, I mean I was mightily relieved when I noticed a little trick they used, I sit end of one row of bench seating, people by the side of me but in the row in front the people start a little to my left leaving me in full view. So as I’m behind the sofa the stars will sit on I’m thinking great I’m in every shot. Then a very pretty young lady is ushered to this seat, and I try, unsuccessfully as I’m twice her size to hide behind her. Only upon leaving when a member of the production team hands me a leaflet about visiting again do I look up make eye contact with the pretty seat filler from in front of me. The show finishes and so I head for Leicester Square to check out show availability. Manage to get Chicago at half price, Then I get my first disappointment of the trip, Jerry Springer the Opera is in “rep” and so not playing this week. So after wandering for a bit considering my options for an evening performance I head back to the queue and decide, based on a friends recommendation to give Our House a go. So I get to the Adelphi and again I’m lucky, I have an end of row seat and it’s about 4 or so rows from the front. Thus making this show WAY TOO HOT for a day like this. Not sure what I mean? Well suffice to say not too may little “Nyl’s” gave their life gallantly for the costumes the female cast wore. Now before you write I know their not nylon but I don’t know what they are made of and it sounded funnier anyway! The show itself was recently made into a movie starring Catherine Zeta Jones, Rene Zellweger and Richard Gere. Tells of Velma Kelly and Roxie Hart two murderers. Murderesses? Never sure how far political correctness has gone. Do murderesses now wish to be called murderers as they are not “second class villains”. In Jazz era Chicago. It’s a wonderfully exuberant show and is choreographed in the style of Bob Fosse ( he of the “lets see if this limb will bend that way” style of choreography ) by Ann Reinking. Ruthie is wonderful in the role of Velma, which she is now doing after a long run a few years ago in the role of Roxie. She is wonderfully complimented by Linzi Hately as Roxie. All the cast are very good with the main roles being played by Rolf Saxon, Norman Pace, Zee Asha and C.B English. I mention these as a way of re-enforcing the fact that it seems “real” professionals in theatre can do 8 shows a week as, as far as I could tell, all the principals were performing when I saw the show. Obviously unforeseen circumstances can happen and this is a justified reason for non-attendance, but I hope this is the start of a trend away from the understudy playing the role at a guaranteed number of performances each week. After this and it’s a late finish, as the matinee doesn’t start till 5pm a new thing to me, as I remember them all starting around the 3pm mark. I’m off to see Our House, a new musical one of the trend based on existing music, this time of the 80’s group Madness. I didn’t really fancy this show, as I can’t really say I’m a great madness fan and the review I read was, well less than complimentary. But all I can say to this other reviewer is did we see the same show? I mean come on, it was one of the most fun shows I’ve seen. The cast were brilliant and the musical numbers staged exuberantly, and were not “just Skanking” (sorry I paraphrase). Tom Firth wrote what I thought was a great story to mould the songs around and it meant you were treated to the “nutty sound” in a whole new more theatrical way. The cast was lead by the very hard working Michael Jibson as Joe Casey, and at this performance Mary Doherty was Sarah. While the only familiar face in the cast, at least to me, was Ian Reddington as “Joe’s Dad”. The story is what happens in Joe’s life after he makes a decision. He breaks into a building site to show his girlfriend a view of Camden and is seen by the police, at this point we see what happens if he runs and if stays and faces the consequences of his decisions. This is done in a very good way the initial split was amazing in it’s simplicity, and from this point Michael Jibson has his work cut out playing both roles some times within seconds of each other, at one point bringing a spontaneous round of applause for one spectacularly quick switch. The music fits into the plot very well and we’re treated to some great performances. Unfortunately your not going to get to see it as this show is the latest casualty of the malaise that is affecting the West End at the moment, and it’ll be sadly missed by those lucky enough to have seen it. A few strange things happened when I got to this theatre, firstly I realised that some people in London are giving American coins and Euros as change for sterling as I found out when the lovely lady in the bar said I’d given her £2.20 and 25cents, and secondly I realised I was still right, working in a service industry would be the best job in the world…if you didn’t have to deal with the public! There two rows in front of me was a pretty lady obviously a member of the front of house staff trying to apologise to a gentleman, who I think I heard him say was from Bangladesh, for the fact that there was no air conditioning in the Theatre. Now at that point you may get an idea of just how hot it was there. I mean they were giving away and I do mean GIVING AWAY water and soft drinks in the interval. How the cast managed to perform in those conditions is beyond me I mean I was melting into a heap just watching their exertions. Another show closing that should have had a well-deserved longer run. After this show it was on the move again on the busiest day of my trip, as I headed across Leicester Square to the Comedy Store, Something I’d wanted to do before but never got round to. I’d wandered over the night before and been told by a very large but helpful doorman that the show was over half way through and so wouldn’t be worth me entering then. So he gave me a brochure and I arrived the next night for the midnight show. Performing this evening were: MC – Tim Clark, together with: John Fothergill, Eddie Brill (from the USA), Angie McEvoy and Junior Simpson and one other who unfortunately in the leaflet I have is only listed as “open spot” not a nice description and I didn’t see a zit anywhere but it means I can’t tell you their name. Okay that was an attempt at humour. Actually the people mentioned were the only performers and perform they did with varying success. Tim Clark was good, Angie McEvoy was ok, John Fothergill a Geordie with a fine line in expletive put downs for hecklers was very good, and Eddie Brill and Junior Walker (the latter being the only person I knew from anywhere) were worth the price of admission and more. 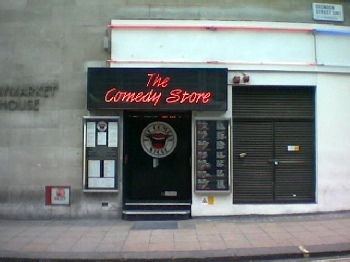 They were funny, very quick and showed how comedy could be done in this the best environment. 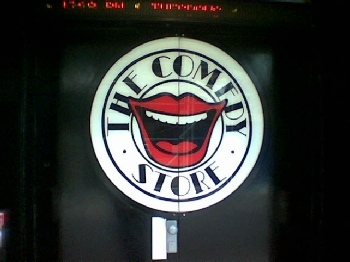 Unfortunately I can’t repeat any of the jokes I heard as being the midnight show most of the best ones would make a docker blush. 2- I burnt myself to a crisp after deciding to save my blistered feet by going on an open topped bus trip on the hottest day in London since 1990! Then to the evening and the best evening I’ve had in London Ever. 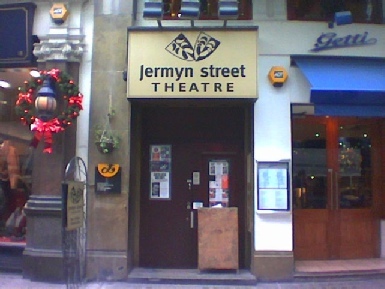 I spent it in the small but perfectly formed Jermyn Street Theatre with the two small but perfectly formed artistes Sarah Lark and Cassidy Janson. They were the latest in the Jermyn Street Jewels season of cabarets. I’ve “known” Sarah for years since her Am Dram days back in Wales and was delighted when she made it to the West End as “the little girl” in Witches of Eastwick. I heard about these cabarets in Musical Stages magazine a wonderful publication run by a lady called Lynda Trapnell (do I get something published int the magazine now?) it is about … well musical theatre all over the world really, with correspondents in many countries. It really is worth getting if you have an interest in Musicals. I’ve put a link on my links page. Anyway back to the evening, well I love cabaret anyway so when I got the chance to see one with someone I knew was going to be great, in London, and at a new venue the chance was too good to miss, so I arrived. 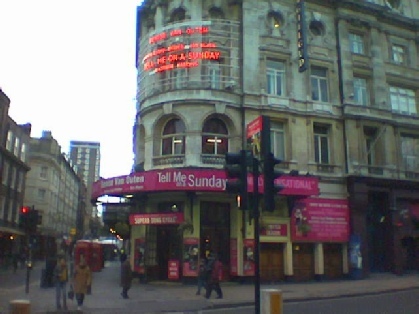 The Theatre is just off Oxford circus. It’s a small performance space. That’s not to say it is too small in fact it’s perfect for this kind of intimate evening. The seats have great leg room as there is a significant well between each row perfect for gangly great idiots like me. You have is a piano played by the musical director for the evening Ben Stock and two excellent performers, well that’s a lie you actually have two excellent performers aided by 3 wonderful supports. Firstly we were introduced to two gentlemen: Steven Carlisle and Stuart Piper who acted as compere and “warm-up act” their words not mine. They sang a very amusing version of me and my shadow, Steven Carlisle sang the amusing poisoning pigeons in the park, a song I haven’t heard since the Hey! Mr producer show, years ago. Next we had the ladies. They met doing Snoopy! The musical at this venue, and tonight they treated us to an eclectic mix of musical numbers I use this description as they didn’t only sing the songs they performed them wonderfully. I can’t list high points as for me the whole show was a highlight. I mean I have most of the songs they featured in my collection, in-fact about half way through I was wondering how they got access to my CD’s. Songs performed included: Sarah & Cassidy In His Eyes (Jekyll & Hyde-The Musical), Sarah There are worse Things I could do (Grease), Sarah, Cassidy and one gentleman Two Ladies (Cabaret) with a very amusing twist towards the end, a duet from Rent where Sarah was joined by Jaye Jacobs a member of the last London cast. Cassidy sang a wonderful version of Meadowlarke as well as a very amusing version of Get Here words changed to suit the new congestion charging in London. And showing she can belt them out with the best of them Sarah sang the powerful “As long as he needs me” (Oliver!). My only complaint was I could have listened all night, and the show was over way too quickly. Oh and I bet your wondering what all the first paragraph was about well, remember what my home page used to be called? The After Show Party Page, don’t know what that means? Worry not, no one got that one. I called it that as that was the one thing I’d always wanted to do, go to an after show party. Ever since Hey! Mr Producer when I stood in the street looking at all the celebrities in a very posh bar, this view repeated after the 10th Anniversary of Miss Saigon. Well tonight I was invited by Sarah, Cassidy their family and friends to a bar and spent the rest of the evening chatting about Theatre in general, at one point re-enforcing my appalling memory for faces by telling a person that I’d seen the Voice of Musical Theatre in Cardiff to be told, so did I … I was in it! Oops sorry about that. An ambition fulfilled. Sarah is now heading for a Post graduate degree in Theatre from the Royal college for a year and then to who knows what, all I know is if there is any justice in the world both of these young ladies deserve a long, successful career in Theatre, and if this is the sort of talent we have in the younger generation ( I sound 90! … I’m only …oh god 16 years older than Sarah… now I’m depressed. ) We have a wonderful tradition in safe hands for the next millennium. I return to the Hotel, start to write this review, deciding to add to it on the train journey on the way home, at the point of getting to the station realise I’ve done it again, Arsenal V Man U Millennium Stadium and the train station is awash with colour. I thank god for air conditioning when I get on the train. At least this time there isn’t the standing room only battery hen situation of the return journey I took a while ago when there was rugby match at the stadium. Also I inotice some differences on this trip, firstly the amount of police on the train, surprising how different they (unfortunately have to) prepare for soccer to Rugby fans. I hope to get back to London in December where I have a feeling I won’t be needing the fan the hotel so kindly provided to stop me de-hydrating to a crisp over night in the wonderful weather I’ve had for the last 3 days or so. Hopefully I can get to See JERRY! JERRY! JERRY! then and we’ll see what else. Something I meant to say if there is anyone out there in the West End or Theatre in general who would like to write something I’d love to put a section on my home page about the reality of working in a field that I only get to view from the outside. Please contact me. If your reading this on Darren’s page there’s a link from his links area, and if you are on Theatrical Reviews.co.uk then you can use the e-mail link on the main page. Also if anyone wants to drop me a few lines then feel free, as you can probably tell from the length of my reviews I love to talk about Theatre.